Lester Desaster and Sarah K Inman from Aqua Mob’s 2017 production of Two Legs Bad. (Photo by Doug MacCash and taken from Aqua Mob Facebook). Wednesday, August 8/Propeller (4035 Washington Avenue): Food, females, and entrepreneurship are coming together for this event. SheMeansBusiness will be celebrating New Orleans’ female entrepreneurs and innovators in food with their workshop on Wednesday. You can learn from local owners, operators and chefs on what it means to feed the Crescent City – with one part tradition, two parts creativity and generous helping of grit. This is a time to meet women who are leaders in their communities, artists in their own right and savvy entrepreneurs who are changing the face of food in Louisiana. The event goes from 8:00 AM until 10:00 AM (you can see a schedule here), and it is free and open to the public. Registration is highly encouraged, which you can do here. Wednesday, August 8/World War II Museum (945 Magazine Street): It may be in the American Sector, but an Italian voice will be leaking from the walls of the WWII Museum on Wednesday (as well as a handful of other dates you can see here). The WWII Museum will be putting on their “The Best of Sinatra” show when they salute “Ol’ Blue Eyes” (featuring Spencer Racca backed by the Museum’s Victory Trio). The event begins at 11:45 AM and goes until 2:00 PM, tickets range in cost, and you can find them here. There are afternoon and evening shows, so make sure to check the times for the tickets you are purchasing. 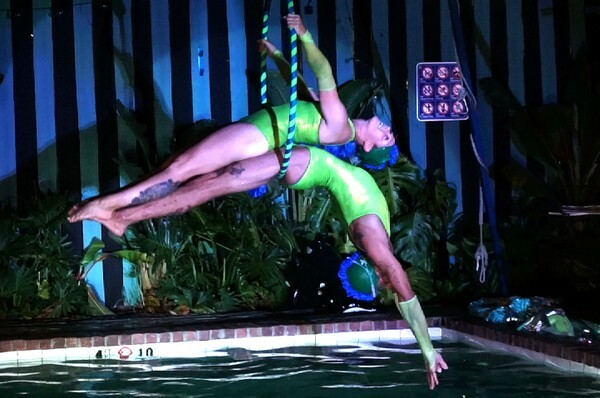 Thursday, August 9/The Drifter Hotel (3522 Tulane Avenue): Are you ready to see New Orleans’ only water ballet company Aqua Mob? Are you just now learning about New Orleans’ only water ballet company Aqua Mob? It doesn’t matter if you are an Aqua Mob groupie or newbie because your chance to see them hit the water and perform tricks and beauties all submerged in a parody of the ’80s animated musical, The Last Unicorn, is here. The show begins at 7:00 PM, tickets will run you $15, and you can purchase them here. Friday, August 10-Sunday, August 12/Bourbon Orleans Hotel (717 Orleans Street): HexFest is back, and with all the tales of the magic of the Crescent City over the centuries, it’s obvious that it will be held here. The conference opens with a Riverboat Ritual and dinner, followed by two full days of workshops, drumming, and ritual at The Bourbon Orleans Hotel–a venue riddled with a history of hauntings. HexFest has gathered Witches, rootworkers, Voodoo priests and other magical teachers from within New Orleans and around the world to offer their time-honored wisdom. The Hex Fest all begins on Friday at 7:00 PM, tickets for the festival will cost you between $150-$350, which you can purchase here. Friday, August 10/New Orleans Jazz Museum (400 Esplanade Avenue): We are sad that Satchmo Fest has come and gone, but that doesn’t mean more jazz information is not awaiting your ears and eyes. On Friday, the Jazz Museum will be hosting “A Historic Night of Afro-Creole Classical Music and Military Participation” towards the development of America’s Freedom and Unique Culture. This musical event will address the military participation of men of African Descent from 1779-1942. The concert and information will start at 6:30 PM and last until 10:00 PM. Tickets will cost you $50, which you can purchase here. Saturday, August 11/New Orleans City Park: Finally, we can see the break in the heat. Well, not quite yet, but we know it’s coming, which means you can start planting again! To help you along with that, The New Orleans Botanical Garden will be hosting a plant sale with a wide variety of plants including annuals, perennials, roses, gingers, edibles, succulents, and native plants for sale to the public. The August Plant Sale takes place at the Pelican Greenhouse, it runs from 9:00 AM until noon, and it is free and open to the public. For full details and location, check out their event page here.